Signs of the season are not hard to miss. Squirrels scurry to search for acorns among the leaves while new birds arrive at our feeders to stay for winter. Inspiration is all around us; just take a look and see what inspires you. This week I introduce to you another fall appliqué to add to your collection. Appliqué’s are fun and easy ways to accessorize. And since they use so little yarn, they’re great projects for using the scraps of yarn we tend to accumulate. Gauge Swatch: 2”w x 2”h (5cm x 5cm) ch 8. Finish off. Sew cone to nut with a yarn needle. If you have any questions while crocheting just leave me a comment below and I’ll get back to you as soon as possible! This entry was posted on Tuesday, November 19th, 2013 at 12:00 AM by Amy	and is filed under Free Crochet Patterns. You can follow any responses to this entry through the RSS 2.0 feed. You can skip to the end and leave a response. Pinging is currently not allowed. Knowing this, I made 4 hearts: one is sea green,pink,fuschia,pale pink and then made the square,joined them,and made 6 rounds of sc, making a mini-blanket. Since I had to do clinicals for nursing school,i had to go to a nursing home. Some of the women have dementia or Alzheimer’s. One such woman touched my heart,and had a doll baby. Her “baby” had no blankie, so in my scrap bag I delved, and I just KNEW I had made that blankie for someone special. The next day i presented her with that blankie and she loved it. She was not speaking that day but the light in her eyes was unmistakable.She was so happy someone had thought about her “baby.” That day everyone was seeing that blankie. Amy, thank you for that pattern and for the motif pattern. You have touched people in ways you never knew possible. Thank you for being you, and you never know when your patterns will touch someone eles’s lives. Such a simple pattern that brought joy to a woman whom alot of people had forgotten. Thank you, Tina. I can’t tell you how much this means to me. We all have the tendency to get in a rut with our lives, and then someone comes along and tells you how they have been blessed, and it just wakes you up. This has to be one of the sweetest things anyone has ever said to me. You are a blessing! So keep up the good work and God bless you! 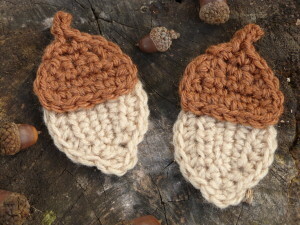 Amy Thank you so much for the acorn pattern. I am planning on using it in a fall garland with some oak leaves to hang in my home. Thanks again. What a wonderful idea, Terrie! I’m so happy you like the appliqué. Amy – I am even more excited! I just found the pumpkin appliqué and will be adding that to my garland also. Thank you again so much!!!! Thank you, Rachel, for all the wonderful crochet patterns you give to us. I use them in so many ways. Each holiday, I send my loved ones greeting cards that I design for each of them, I like to include some little thing I have crocheted for them. The crocheted item (usually an applique’) is flat and soft, so it mails easily. Thank you for making this possible for me to do, using your helpful patterns. Thank you for the Acorn pattern. My family is having a “Nut Gathering” (not allowed to call it a Family Reunion) in a few weeks. I am going to make these up as fridgies for party favors, if you will. I might even stitch “2014” in black..we’ll see. 🙂 Thanks again! I’m so glad you are able to use my pattern! Have the best of fun!